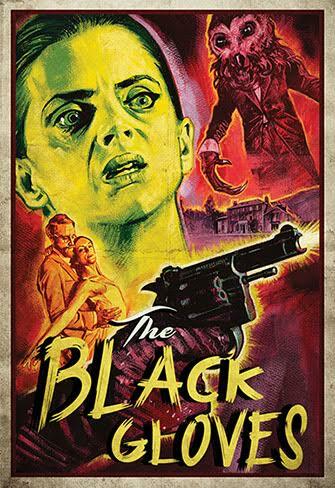 Director Lawrie Brewster and writer Sarah Daly are back with Gothic noir THE BLACK GLOVES, a 1940s-set chiller featuring the Owlman, the iconic villain and viral sensation from their acclaimed debut feature LORD OF TEARS (review here). In the bleak Scottish highlands, Finn counsels his new patient, under the watchful eye of her sinister ballet teacher. He soon finds himself entangled in a ballet of paranoia, dark agendas and a maze of deadly twists and turns, as the legend of the Owlman becomes a terrifying reality. The film continues the trend for black and white horror alongside recent titles such as A GIRL WALKS HOME ALONE AT NIGHT, THE EYES OF MY MOTHER (review here) and A FIELD IN EENGLAND, but for inspiration for the film, and its style, Brewster and Daly looked to cinema history. Hex Media, the fiercely independent Scottish horror house behind LORD OF TEARS, THE UNKINDNESS OF RAVENS and THE BLACK GLOVES, is the passion project of Brewster and Daly, who have been quietly blazing a trail in the genre since the company's inception five years ago. The film is a co-production between Hex Media and long-time partners Dark Dunes Productions in association with 3rd Monkey Entertainment and Lights Out Productions, and is set for release in Autumn 2017.